So what does your money get you? Firstly, you get a Blu-ray player, although in comparison to other machines it's far from state-of-the-art. Connectivity comprises a single HDMI output, USB and Ethernet ports, and stereo analogue and coaxial audio outputs. The USB is used in conjunction with a supplied Wi-Fi adapter. Both this and the Ethernet connection are provided to get the Cinema One online where it will grab data related to imported discs, and access the Kaleidescape Movie Store. You can't bring in your own media files from a storage device or your home network. Nor will the Cinema One play DVD-Audio or Super Audio CDs, which is a pity considering its main raison d'etre is as a luxurious vault for all your entertainment content. Says the company: 'It is unlikely that we will support Super Audio CD or DVD-Audio due to the tepid market acceptance and declining sales of these formats.' I'd argue that the premium systems that may be served by the Cinema One could well be owned by multichannel music fans. Furthermore, the Cinema One turns a blind eye to 3D Blu-rays. When we previously spoke to the company about stereoscopy, we were told it was waiting for a 3D-enabled chipset to become available that would be suitable for its products. It obviously still hasn't found one. The jukebox functionality is where Kaleidescape's new machine warrants its price tag. The disc-player element is matched by a 4TB server, capable of storing around 600 DVDs, 100 Blu-rays, 6,500 CDs or a mixture of all three. These rips are offered with transparent AV quality, their relative disc's menu options and served up with hi-res cover art and oodles of Kaleidescape's own metadata. Browsing your media therefore becomes a glitzy experience – you can peruse a fullscreen montage of Blu-ray sleeves, search the library for specific actors, directors, genres, etc, or, perhaps, just decide to play every track stored on the Cinema One that Kaleidescape has tagged as Speed Metal. In addition to this, a ripped file becomes swiftly accessible – there's no need to wait while a Blu-ray loads up, no menus to skip and you can access user-defined scenes (or those already curated by Kaleidescape's metadata squad) with just a few button presses. In all, it's a fantastic interface and system that's easy to fall in love with. A fly in Kaleidescape's ointment concerns Blu-ray. Due to the demands of the Blu-ray Disc Association, a ripped BD will only play if the physical disc is in the Cinema One player. Considering it takes a good while to import a disc, the fastest way to spin a BD movie is just to insert it, press play and not bother ripping it – here you still get all the metadata goodies and the ability to skip menus and trailers. The solution to this problem is to link the Cinema One to Kaleidescape's DV700 Disc Vault (stashed away in a rack), which can store 320 platters. House titles here, and the Cinema One will then be allowed to spool out the ripped file. The DV700 typically sells for £4,600, but you can buy it together with the Cinema One for £6,775. An alternative to archiving Blu-rays is to download Full HD movies directly from the aforementioned Movie Store, an online service that launched in the UK this Summer. They're supplied with the same audio tracks (including lossless) and extra features as their counterpart Blu-rays. Prices range from £8.99 to £13.99 depending on the title. DVD-quality downloads can also be purchased for less. The Movie Store currently offers a range of film and TV series from initial partner studio Warner (US consumers get Lionsgate titles, too). Kaleidescape tells me it is hard at work to secure more content deals from other studios. A very recent addition to the Movie Store also goes some way to working around the server's BD limitations. Courtesy of a new UltraViolet-linked disc-to-digital feature, you can pay a fee (£1.49) to acquire a digital version of a Blu-ray title you already own (e.g. one ripped to the player). This version can then be downloaded from the store to be watched, and there's no need to have the disc in the system anywhere. The Cinema One uses a full-width chassis and looks neat and tidy on your rack. The outer grey metal case gives way to a white plastic fascia, with a disc slot (rather than a tray) on the left-hand side, basic controls on the right and the Kaleidescape logo taking centre stage. The player is supplied with an HDMI cable, Ethernet cable and Wi-Fi adapter. The remote control seems a little less luxurious than the main unit, but is at least backlit and sensibly designed. An alternative control option is Kaleidescape's free app. This is only available for Apple's iPad and as such went untested here. An Android version would be handy. You can also buy a dedicated 'Child' remote that's designed to make it easier for junior film fans to find movies that their parents have tagged as child-friendly. The Cinema One is a joy to use. The menu systems are mostly intuitive, meaning it's easy to perform tech tasks such as changing the output resolution or establishing a Wi-Fi connection. Slide a disc into the slot and you're quickly presented with its vital statistics and given the option of playing it or importing it. Do the latter and it will give you an estimated time to complete the task – be prepared for BD rips to take a while; copying The Cabin In The Woods was achieved in 1hr 40mins. AV quality is faultless. Blu-ray material archived to the 4TB hard drive plays out with no discernible difference to its disc-based brethren. Edges are sharp, motion is smooth and there's oodles of detail on show. Soundtracks can either be bitstreamed (up to 7.1) to your AVR, or decoded as PCM. Similarly, ripped CDs retain their original clarity. 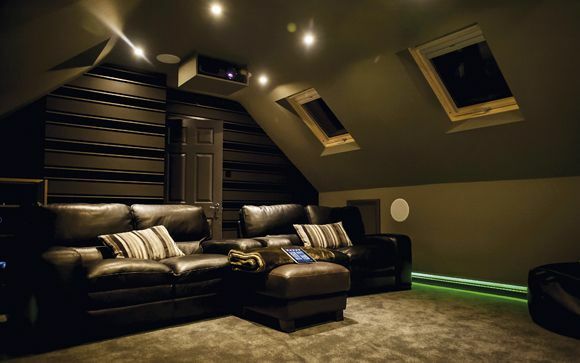 At the mere mention of Kaleidescape, some AV enthusiasts are prone to frothing at the mouth and explaining that they can achieve much the same system with a few terabytes of storage, some media playing software and a BD ripper. However, the Cinema One (and the brand's other products) just aren't aimed at such consumers. This is an ultra-slick, simple-to-use alternative to a DIY server, and one that doesn't tread on any legal grey areas and, in my experience, never crashes. It therefore has considerable appeal. Where it dazzles is as a DVD and CD repository. Chuck these platters onto the roomy HDD and they go from being a jumble on your shelf to a neatly navigated collection. But a change to the Blu-ray playback criteria is what's needed to make this be a must-own product for everyone. Likewise, the Movie Store still needs more content and the player itself could offer more – a quieter running noise, SACD/DVD-A playback and support for 3D Blu-rays. Existing Kaleidescape customers will see this a simple, affordable addition to their setup, bringing the functionality to another room, perhaps. And if newbies can accept it as a Blu-ray player rather than a server, they'll no doubt be impressed, too.